We manufacture LPG Cylinder filling stations for filling LPG gas in cylinders of various capacities . This is a custom built ready to install plant . 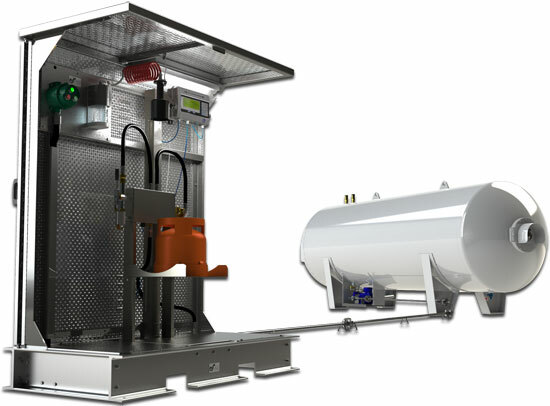 Their are various models available with storage tank capacity ranging from 500 Liters to 500000 Liters and with the choice of single or many cylinder filling scales . The unit comes with all safety features as per norms . The unit is easy to install and operate and much cheaper as compared to other plant. The filling scales comes with auto cut off facility with manual or electronic filling scales . The unit is provided with cylinder evacuation system , cylinder testing system , multi filling points for filling cylinders of various capacities like 3,5,6,12,15,19,35,48kgs at the same time . We seek to create long-term relationships built on results. See how your business can benefit with BNH Gas Tanks on Your team. Response time of 24hrs. Our support office is availbale monday to saturday. Instant response time from monday to saturday from 9am to 6pm. B-23, Mayanagari Building, Dapodi, Pune – 411 012, India. Experienced and leading manufacturer and exporters of storage and transportaion of LPG,Propane, Ammonia, Argon, CO2,Oxygen, Propylene. We provide complete design ,fabrication and installation for LPG. We provide complete solution for storage and transportaion. © copyright 2018 BNH Gas Tanks. All Rights Reserved. Developed & Maintained by Codepater Pvt. Ltd.